Following a 10-2 start, the Jaguars are making their case to compete for a league title. There's little predictable about high school athletics. Things can change at the drop of a hat. Injury, illness, discipline in the wake of academic or off-the-field missteps — all can derail what has been, is or could be for a team on the field or court. 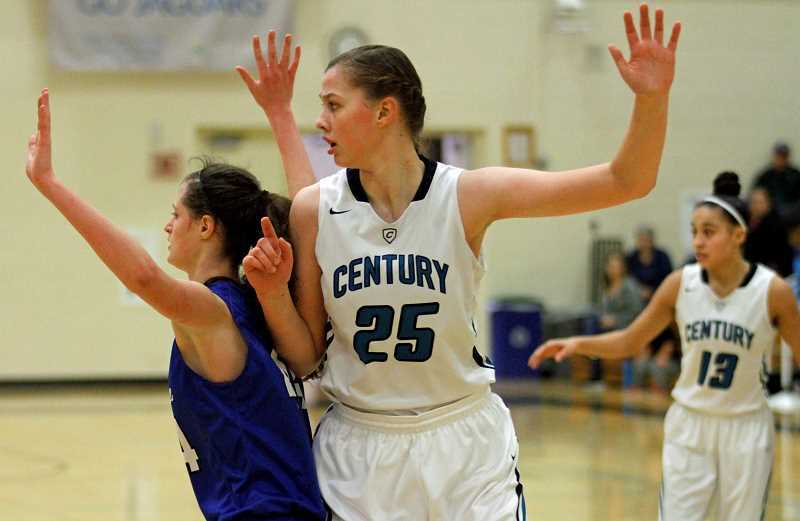 The Century girls' basketball team is no different. To begin the year, head coach Dave Gainey and his squad had high expectations for a roster with a nice mixture of returning talent and young up-and-comers. In a new conference, minus the "super team" talent of schools like Jesuit, Southridge and Beaverton of the Metro League, the Jaguars were focused on a playoff opportunity that they believed was there for the taking. Since that beginning, however, Gainey and his team has been forced to do more with less as a result of various misfortune — and they've stepped up. "We've done a pretty good job, and honestly, probably a little better than I expected as a result of a few tough breaks," said Gainey. 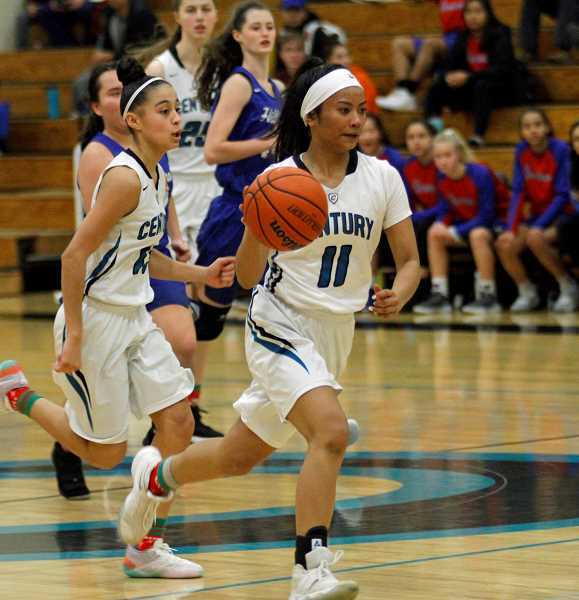 The Jags lost key sophomore Katie McKinley to a torn patella tendon this past summer, starting senior Kess LaCounte to a torn ACL during a game against Lakeridge this past month, and had another contributor lost due to personal tragedy. Nonetheless, Century is 9-2 overall, ranked No. 11 in the OSAA rankings, and aiming high as the league season sits squarely on the horizon. "I'm really excited about what's going on," Gainey said. "We've had some tough blows, but we've overcome them to this point. And with primarily eight girls playing, everyone gets minutes and for the most part is happy." Since a Dec. 18 loss to No. 7-ranked West Linn, the Jaguars have won five straight contests, including wins over Madison, Sunset and Hillsboro in the Century/Hillsboro Tournament Dec. 27 to Dec. 29. They're led by guards Janelle Maligaya and junior Angie Baltazar, forward Sarah Gruber, and 6-foot-6 junior post Amy Walkenhorst, whom Gainey says has progressed nicely since her sophomore season. "She's made quite a few strides," said the coach. "A lot of teams try to shove her around, but she's getting better at holding her position and finishing better. She's shot the ball fairly well from the outside, and that's big for her confidence. She knows it's okay to step out to 10 or 12 feet now and take that shot." Gainey raves about Maligaya and the presence she brings to the team, and he spoke to her ability to perform when her team needs her most. The senior has twice led her team to victories in the final seconds of games, once with a last-second three-pointer to get Century to overtime — and an eventual win — against South Salem, and another with a winning three-pointer in the waning moments of a tight game against South Eugene. The coach also preached the importance of Baltazar, speaking to her relentless yet light demeanor as a catalyst to the girls around her. "She's a happy-go-lucky kid who just loves to play," Gainey said. "She's done a nice job of running the show and getting us into our plays, and her attitude is contagious." Gainey attributes much of his team's early-season success to offseason work in the weight room, which allows the athletes to better withstand the physical rigors of the game. But he also points to their newfound confidence. After suffering at the hands of Metro League behemoths in recent years, Gainey chose to steer clear of "super teams" like defending state champion Southridge during this past summer, choosing instead to play primarily against teams more comparable to his Jags and the teams they'll be playing during this year's Pacific Conference slate. As a result, they've won more games, and that winning has built a confidence that had eroded due to lopsided games against elite-level talent. "We know when you're playing those super teams, you have to play perfect, and you still might lose by 10," Gainey said. "Now you play perfect or well, and you're going to win. So much of this game is mental — if they at least think they can do it, it helps a ton." The coach said that at the beginning of the season, they talked as a team about focusing on finishing in the top three of the Pacific Conference and earning a playoff spot. Now, however, Gainey feels that they have a real shot at competing for a conference title, and his girls are starting to believe as well. "I think we potentially have a chance to win the league if we play well, but we have to stay injury-free," he said. "Having said that, Liberty, McMinnville and Sherwood are going to be tough, and Glencoe's been a nemesis. On top of that, Forest Grove's been playing really well, so there's not going to be anything easy about winning anything." Century was scheduled to open league play Tuesday, Jan. 8, at Newberg, after this paper's print deadline, and will host McMinnville Friday, Jan. 11, at 7:15 p.m. at Century High School.